This river valley project includes two sections of trail in the west end of the City comprised of approximately 5 km of primary (paved) and secondary (gravel) trails. 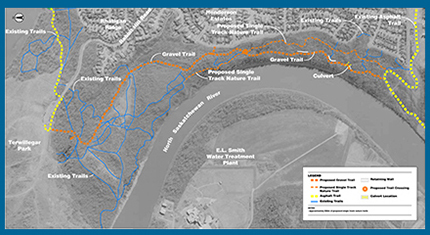 These trails provide critical links in the trail and park system on both the north and south banks of the river. The north trail links Terwillegar Park with the Fort Edmonton Footbridge. The south trail links the Terwillegar Park parking lot to existing trails near the Anthony Henday pedestrian river crossing. The West End Trails and Terwillegar Park Footbridge are a key component to achieve connectivity within the river valley. 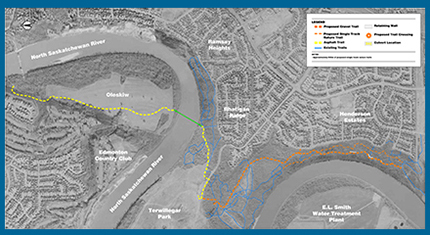 The West End Trails budget is $3.5 million and is being funded by the River Valley Alliance, the provincial and federal governments, and the City of Edmonton. Will there be changes to the current dog off-leash boundaries? No changes to the current off- leash boundaries are to be implemented as part of the current trail and bridge construction. Will the bridge and trail in River Valley Oleskiw be on- or off-leash? The north boundary of the current off-leash area in Terwillegar Park is the riverbank. The new bridge, the gathering point at the south end of the bridge, and the trails in River Valley Oleskiw are not approved as off-leash areas and will require that dogs be on-leash in those areas. Is there a plan to change the natural state of Terwillegar Park? No. Direction for these projects has been influenced in part by the City of Edmonton’s Terwillegar Park Concept Plan, which commits to preserving the Park’s natural resources where possible. The Terwillegar Park Footbridge and West End Trails have been designed to minimize their impact on the natural landscape, while still increasing accessibility for Edmontonians of varying physical abilities. Why are the trails being paved? 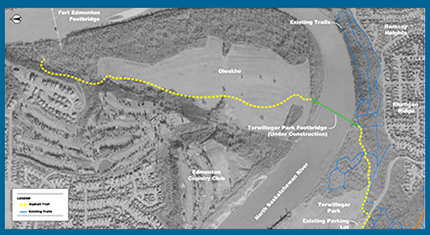 The trails between Terwillegar Park and Fort Edmonton Park are being paved as part of the City of Edmonton’s commitment to a connected river valley park system that is accessible by Edmontonians of varying physical abilities. How will this trail upgrade affect groups who currently use the undeveloped trails? Many of the existing undeveloped trails will continue to be available for those people whose activities are best suited for undeveloped trails. 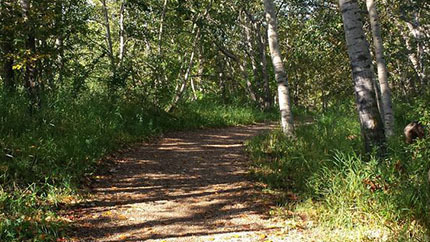 A portion of the existing, undeveloped trails in Terwillegar Park and River Valley Oleskiw will be widened and resurfaced. This is being done to ensure that Edmontonians of varying physical abilities can enjoy the river valley park system.